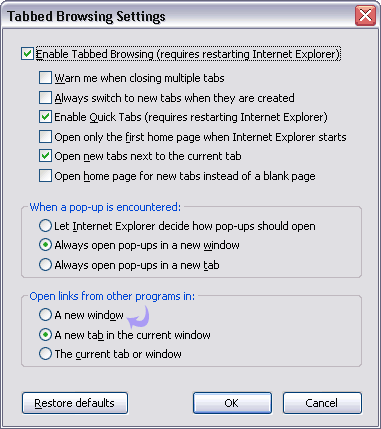 By default links from external applications load in “New Tab of existing Window” in Internet Explorer. Few users may prefer to open external links in separate new Window for easier identification and navigation instead of new tab. 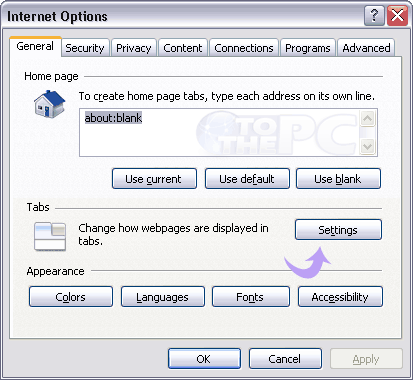 Alternatively, few users may want to open links in existing tab of current window. Here is simple procedure to configure same. 1. Open Internet Explorer on the computer. 2. Goto Tools > Internet Options. A new dialog box will appear. 3. Click “Settings” button next to Tabs option. 4. Select “A new Window” option and click OK.
To open links in current tab or window, select option “The current tab or window” and click OK button. Happy browsing in Internet Explorer. I have IE8. Links I click will only open in the current tab (current window) no matter what settings. I have my settings exactly as you instruct but still doesn’t work. If I select Open Links in A New Window, it still opens in same tab, same window. If I select Open Links in a New Tab in the Current Window, still opens in same tab, same window. How do I fix this? ?